Impressive tree-quite haunting in this night scene. The wall adds some nice detail, and I like the background trees. Quite a striking image. A few thoughts about the composition- perhaps rotate a bit counter-clockwise to straighten the wall? Not sure how the tree would look if you did that, though. The tree appears to be nearly in the center-I'd be tempted to crop a bit off the left side for better balance. What is that interesting red streak in the tree? (Uncompressed view). Thanks. The red streak is an airplane. The fence and tree are on a slight hill so I thought I wouldn't make the top of the fence level. Ah- explains it- (The red streak). It's interesting how, in a photo, a slanted hill can look crooked , but if you are looking at the real thing, it makes sense. Perhaps making the fence level in the picture would tilt the tree unnaturally. But my eye, in this picture, wants the fence to be level, whether it actually makes sense or not. . Maybe that's a lot on nonsense! 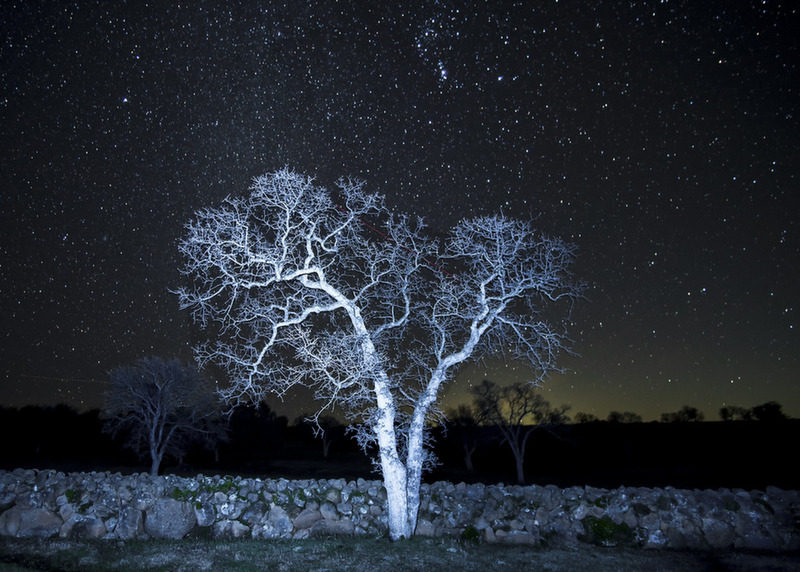 You have to click for the uncompressed view to fully appreciate the delicate detail of the tree branches against the night sky. That's my favourite part of the image.